Bud: All cowboys ain't dumb. Some of 'em got smarts real good, like me. 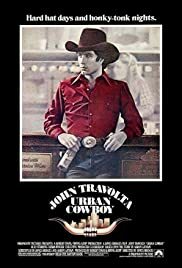 For Urban Cowboy John Travolta plays one of the stronger alpha males ever portrayed on the big screen. He's a decent enough young kid who leaves his parent's homestead and strikes out for the big city of Dallas where his uncle Barry Corbin has promised to find him work in the petrochemical industry. In 1980 that was beginning to boom and Texas was definitely a growing place in the USA. Travolta does a good job in making we the audience care about his character who when you come right down to it is a sexist pig. He meets and marries Debra Winger who's from the same background, but she's got some ideas that women should not be shadows of their men. And when she beats him at Gilley's mechanical bull, a man's game, that's it for him. Scott Glenn who's an ex-convict is working at Gilley's and this film was his breakout role. He's a real snake in Urban Cowboy, he gets Travolta's goat with a mere look and he moves in on Winger. Travolta in turn takes up with rich girl, Madolyn Smith Osborne who's slumming at Gilley's. Despite the characters, Urban Cowboy was really one gigantic commercial for the self-styled biggest honky tonk in the world. Gilley's is no longer there in the suburban Texas community of Pasadena, but the memories do live on. And the best thing about Urban Cowboy is the wonderful score of country/western songs that were featured in the film. I'm not sure if some of the songs were not written specifically for Urban Cowboy, but it's the only reason I can think of why the Motion Picture Academy ignored the musical aspects of this film. I especially liked Johnny Lee's Looking For Love, if it was specifically written for this film, it's a disgrace that it wasn't nominated for Best Song. I liked Debra Winger's character best in this film. She doesn't lose a trace of femininity, but she stands up to Travolta and does it in style. And this review is dedicated to that yet as unknown woman who will one day be the first woman bull-rider in the Professional Bull Riders.